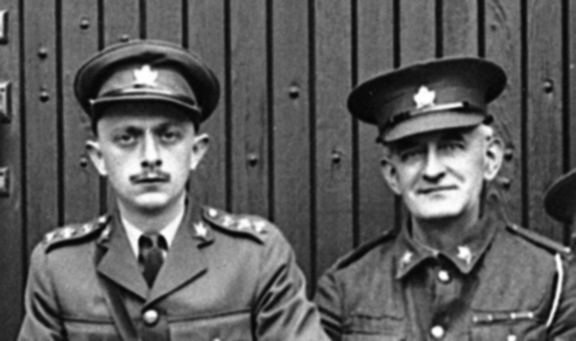 The post WW1 period saw another reorganization of the Canadian military. The practice of generically numbered battalions reverted back to the prewar unit names. 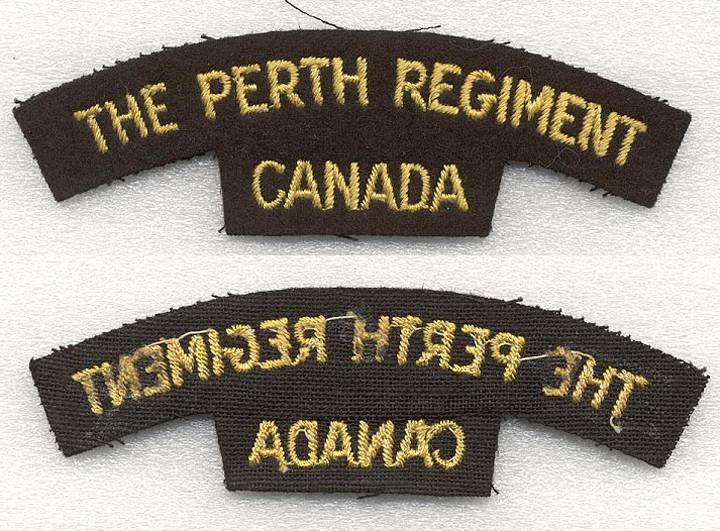 On April 1, 1920 the regiment was redesginated “The Perth Regiment” (perpetuating the 110th battalion C.E.F). This change also led to the creation of a whole new design of insignia. It was decided that the Perth County coat of arms should play in integral part of that new insignia, a decision that would play a part in future badge designs. 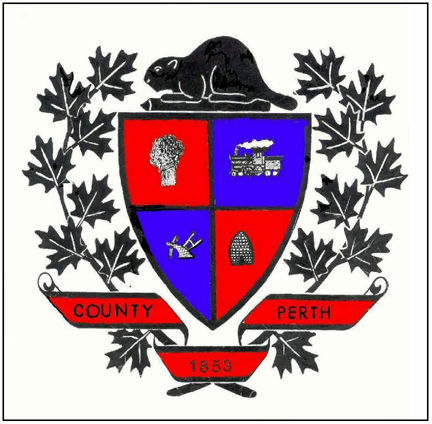 The county coat of arms consisted of a shield divided into 4 sections, each depicting a part of Perth county life. (Upper right) a train representing the progress of industry. The Grand Trunk Railway had their shops located in Stratford since 1870. (Lower right) a beehive representing the industriousness of the citizens. Original badge line drawings and a souvenir post card, both by W Scully ltd. 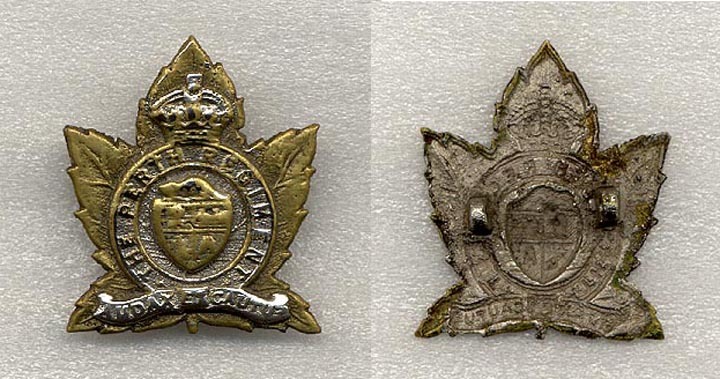 There are at least two distinctly different dies used for cap badges during the period. It is quite possible that the die used on the first cap badges was either lost or destroyed as the bulk of badges found are stamped from the second die. Below is a list of all the known variants of cap badges. 1st Pattern Cap badge circa mid 1920’s. Lettering is larger in the scroll than in later issues. Not as much detail in the veins of the maple leaf. No periods or dots prior to the “T” in The or after the “T” in regiment. No maker marks. This particular badge has had the center “domed” outwards which was commonly done by the soldiers. The second pattern of cap badge is the more commonly found variant. 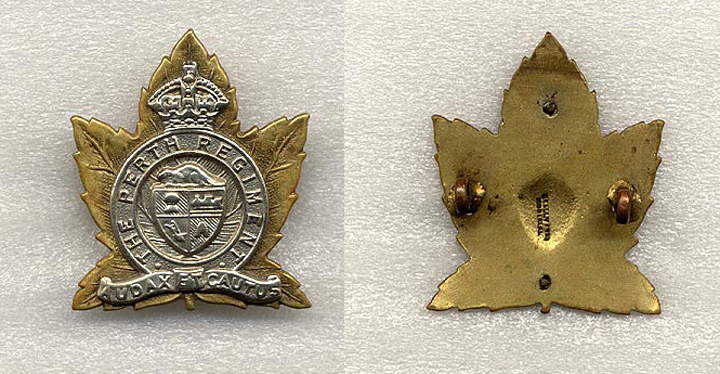 The distinguishing features of this badge include more detail in the veins of the maple leaf. Periods or dots are found before the “T” in the and after the “T” in regiment. Unissued cap badges came in a dull chocolate brown coating. Soldiers were instructed to shine their badges by removing this coating to reveal a copper bronze badge. No maker marks but believed to be manufactured by Scully Ltd of Montreal. 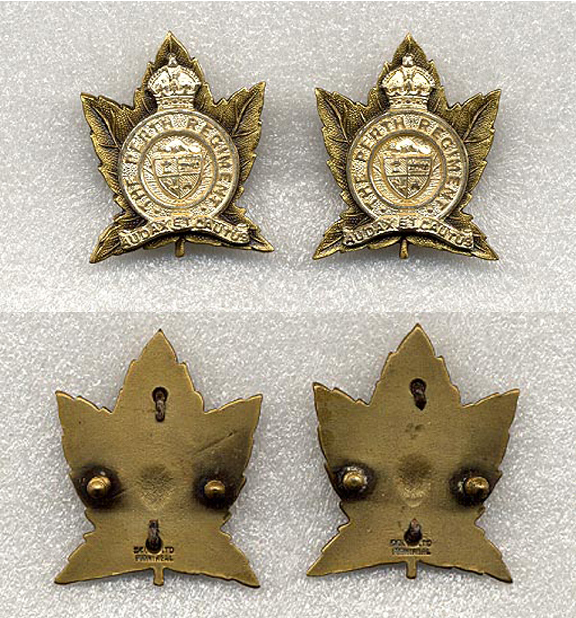 While these are the 2 primary examples of other rank cap badges, a number of other variants exist, some of which were unofficially altered or added to by men in the field. An example of a pre-war cap badge with a slider attachment. This example was never fitted with lugs. During the 1930’s there was a period of time when badge manufacturers adopted the use of sliders. It did not last long with them reverting back to the use of lugs as the preferred method of attaching a badge to headgear. Examples of Perth badges with sliders are quite scarce. 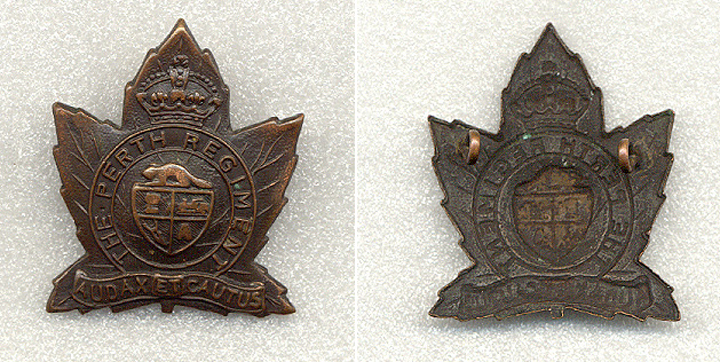 Cap badge made by Roden Bros. The vast majority of cap badges do not have a maker mark on them. In addition to Scully Ltd, it is known that Roden Bros also manufactured badges for the unit. Badges made by Roden Bros can be distinguished by a small “R” found on the back of the badges. 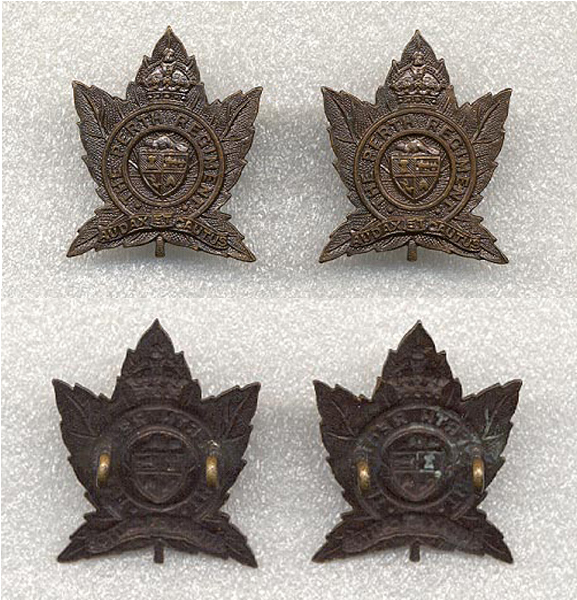 While brass was the preferred metal to be used for other ranks cap badges, the Perth’s were one of the few units to have their badges primarily made in bronze. 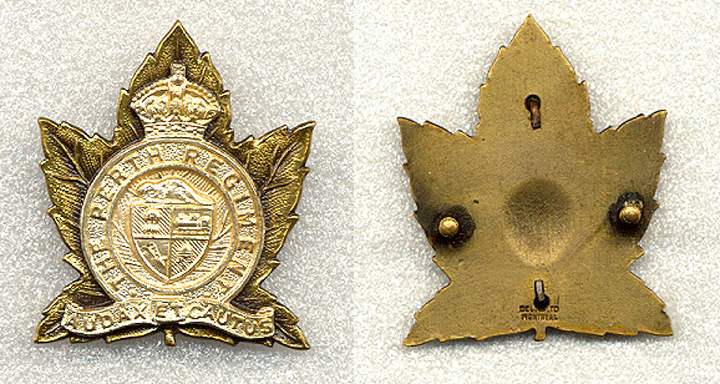 Brass examples do exist of the badges, and were likely manufactured during the war. There are no known examples of brass collar badges which suggest that these were made during the later part of the war when collar badges were not worn. One other alteration that was commonly done towards the end of the war was to wear a coloured cloth backing behind the badge. There is some debate as to which colour was to be worn. The above example made from a canvas 1st div distinguishing patch clearly shows that red was one of the colours worn. Red was the colour authorized for wear by infantry units. Several veterans of the unit also suggested that they wore maroon backings behind their badges to represent the 5th Armoured Division. These badges have been reproduced for the re-enacted unit. There are ways to tell the difference between the repro badges and the originals. 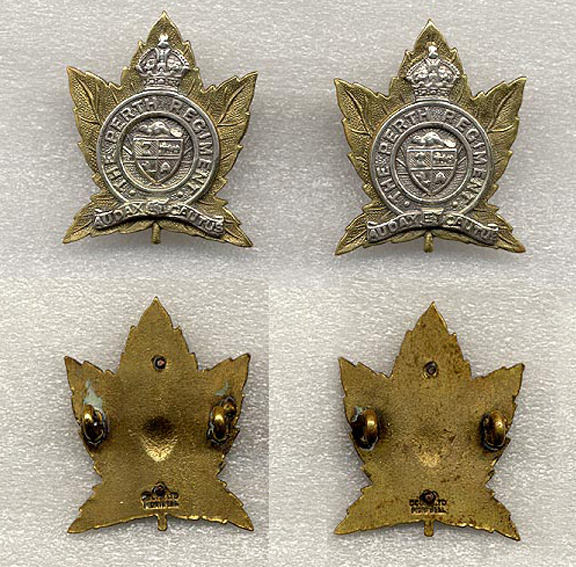 Officers’ cap badges mirrored the pattern worn by other ranks. The primary difference was that they were bi-metal with the crown and scroll being in silver on a brass/gilt maple leaf. Despite the fact that a single company ( Scully Ltd )made most of the badges, there are an interesting number of variations. Unlike the other ranks, officers were not issued badges but were expected to purchase their own. The earliest known version circa late 1920’s early 1930 came off a pre war pattern officers’ service dress cap. Unlike subsequent examples, this pattern is a one piece crude casting and plated in gilt and silver. The silver plating has worn over the years in several areas. The lugs are cast as part of the badge. This was likely done as a cheaper alternative to purchasing a professionally made one. The next 3 badges were all made by Scully limited of Montreal. 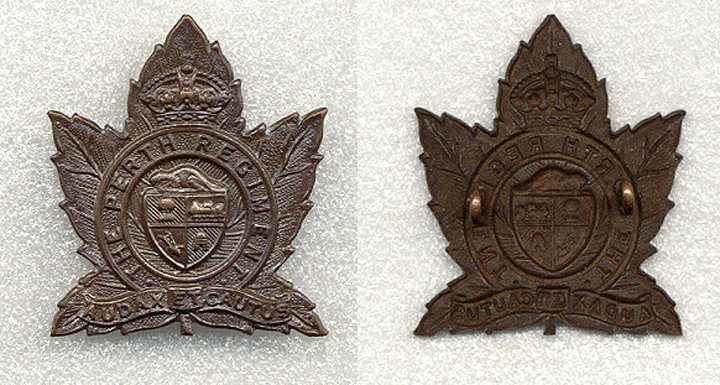 The example pictured here is a two piece cast badge. The silver overlay is a separate piece “pinned” to the front of the badge. It is a solid backed badge with the manufacture stamping W Scully Ltd Montreal in the centre of the badge. The badge has lugs as a means of attaching the badge to headdress. A three piece Scully made badge. Also using lugs, this version has the coat of arms as a separate 3rd piece. The depression in the centre of the badge is a result of the manufacturing process. It is stamped W Scully Montreal at the bottom of the badge. The Scully made officers’ badge is significantly different from the preceding patterns. Instead of using lugs, this badge has screw posts as a means of attaching the badge to headdress. It is a two piece badge with a frosted silver overlay attached to an antiqued brass/gilt leaf. 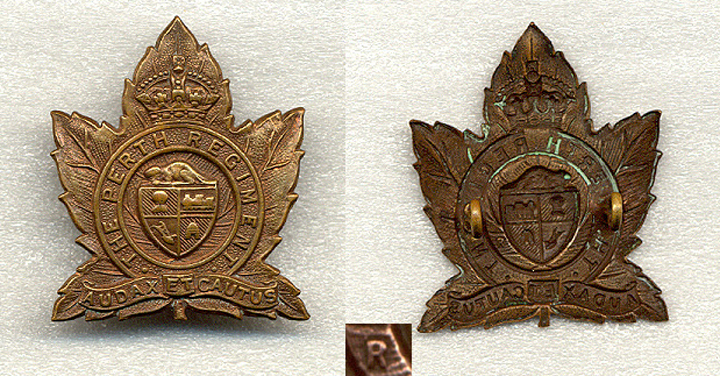 It is stamped Scully Ltd Montreal at the bottom of the badge. Many units’ officers had embroidered badges made privately. This was a practice seen in the later years of the war 1943-1945. The exact place of manufacture is unknown. 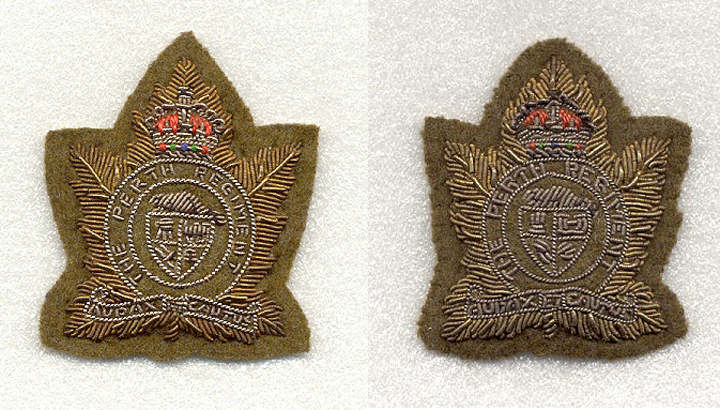 On the left is a mint example while the one on the right has been removed from a beret and was worn by the regimental commander LCol William S. Rutherford. Examples of these badges are rare. These embroidered badges were primarily for wear on berets. Collar badges were an integral part of the militia uniform from 1920 until the adoption of battledress. Prior to battledress, the principal uniform worn was that of service dress. Similar in appearance to the WW1 uniform, other ranks service dress had a stand up collar. Both other ranks and officers were expected to wear collar badges on their service dress. The collar badges worn during this period are essentially a smaller version of the cap badge. 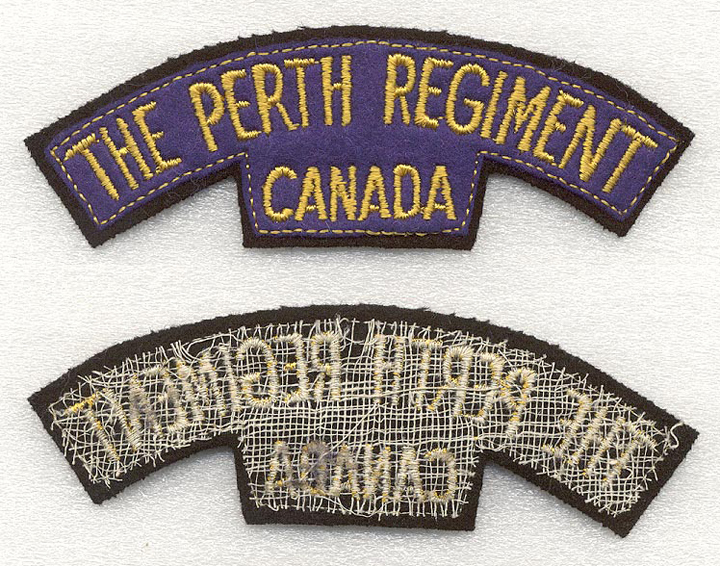 Unlike many units that have a different left and right collar, the beaver on the Perth Regiment collars faces the same way (left) when viewing them. The explanation for this is unknown but the additional cost of having different dies made could have been the reason. Other Ranks’ Collar badges. No maker’s mark but believed to be Scully. Note both beavers face left. Lug backed. 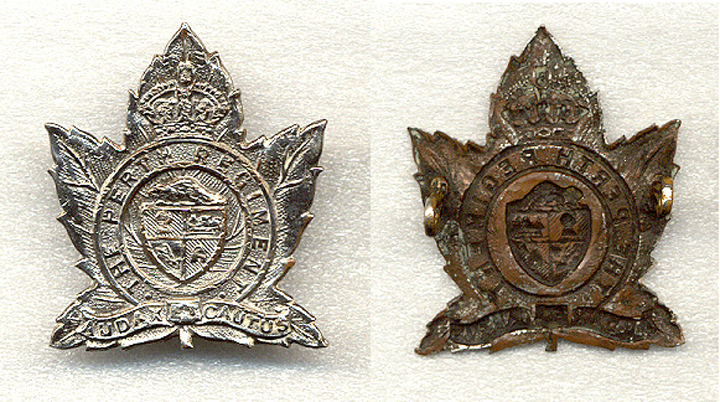 Officers’ Collar badges. Scully manufactured frosted silver and gilt collar badges. Screw post backed. Collar badges were worn by other ranks until the issuance of battledress. For the Perth Regiment, that was on March 13th 1940. Collar badges were not to be worn on the new battledress. On March 28th 1940, all other ranks were ordered to return their collar badges to QM stores immediately. 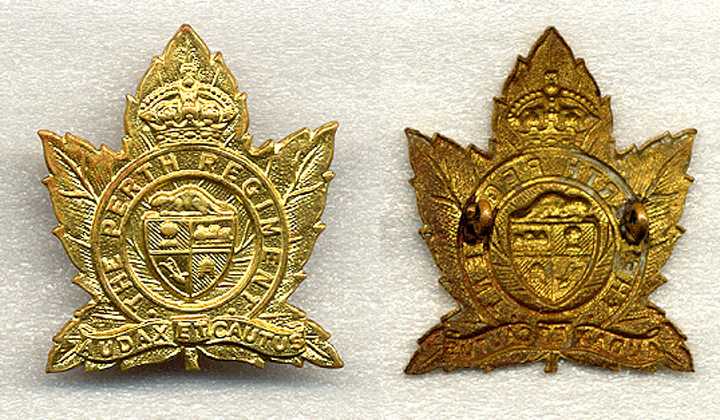 Officers continued to wear collar badges on service dress throughout the war. 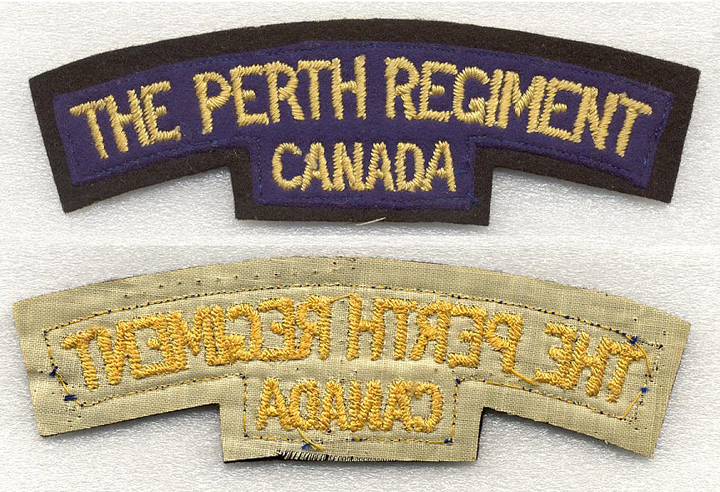 The first titles worn by the regiment during the period 1920-1948 were bronze and brass PERTH titles. The exact period for each and the reason for the two different materials are unknown. These were worn on the service dress epaulettes until battledress was issued. They continued to be worn by officers on service dress until they were replaced with plain brass CANADA titles in 1942. This provided a challenge for officers as the proper method of wearing these badges would hide their rank insignia. It was common for officers to trim the top of the titles and sew them near the shoulder seams of the sleeves. These slip on titles were not worn with any other insignia other than rank. When the unit went overseas in late 1941 they would have been wearing slip on titles. 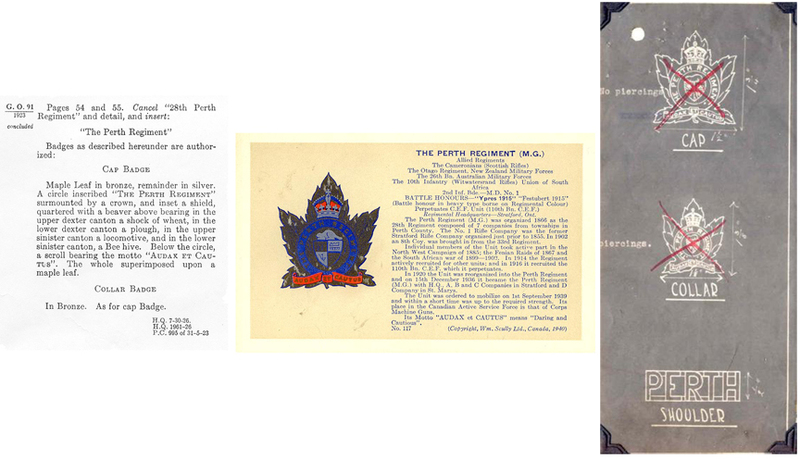 In April 1942, the Perths as part of the 5th Canadian Armoured division adopted a new method of unit and regimental insignia. Distinguishing patches would replace the slip on titles. Rather than adopt the methods chosen by the 1st and 2nd divisions, the 5th Armoured Division would use unit abbreviations on the maroon divisional patch. Since the word CANADA was not part of the patch, a separate CANADA patch would be worn above the distinguishing patch. Regimental regulations stipulated that the top of the patch would be 3 inches from the shoulder seam. Top row, left, Embroidered single period. Bottom row, Right, Embroidered single period (orange). 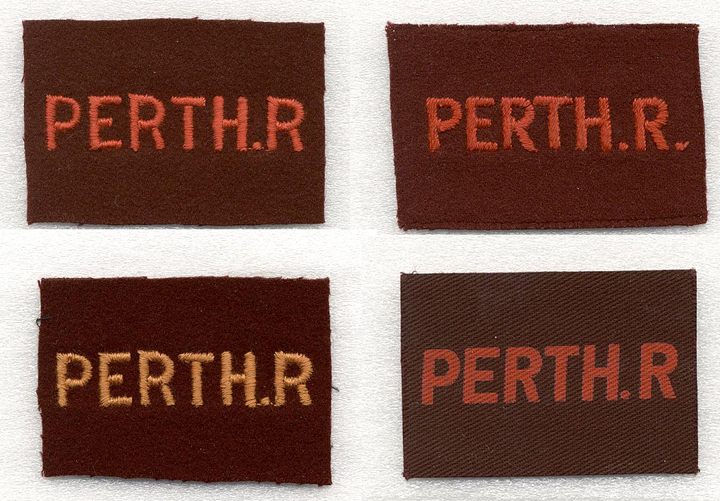 There are four known variants of the Perth R distinguishing patch, all with unique characteristics. The upper two in the picture are embroidered red lettering on a maroon divisional patch. The primary difference between the two is the additional period after the “R” for the patch on the right. The third variant was originally thought to be a faded example. In fact it is not faded but rather a different dye lot used in the lettering. The fourth example is a printed canvas example. In Italy, distinguishing patches were worn either sewn directly onto the battledress, khaki drill shirts also known as bush shirts or were worn on brassards. Removing the insignia on a brassard made cleaning the garments that much easier. 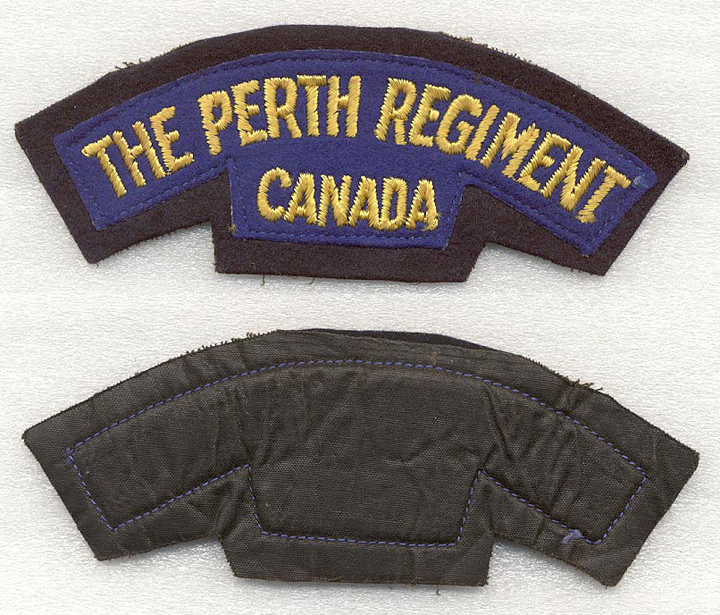 Left, Perth R dist patch worn on battledress. The move away from distinguishing patches in favour of unit titles over plain divisional patches had begun much earlier for the units already serving in NW Europe. 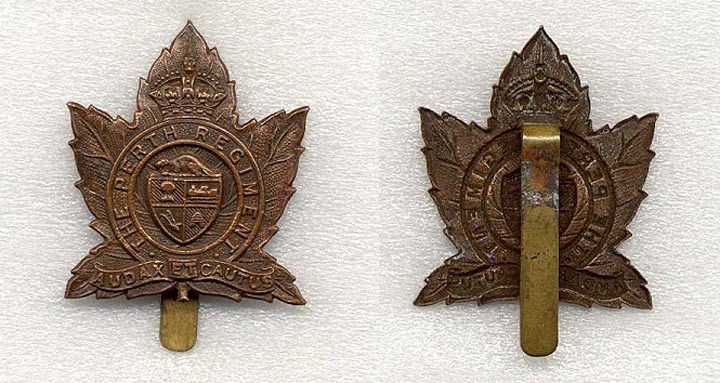 In the name of consistency, it had been decided units from the 1st Canadian Corps would adopt this method of insignia. The design of the Perth Regiment’s shoulder flashes had begun almost a year earlier. On April 28th 1944 while the unit was still in Italy, a design was approved which would be the blueprint for the printed canvas title. The government had done some earlier testing with the printed titles to ascertain their longevity. It was found that the printed variety tended to fade over time and was more likely to curl at the edges with wear. Cloth embroidered titles tended to be more popular with the men and these would often be seen on their best or walking out uniforms. One of the first of these titles to make its way overseas was courtesy of the Stratford chapter of the IODE (Imperial Order Daughters of the Empire). As a sign of supporting their regiment overseas, they raised money to have shoulder flashes made and sent to the unit. 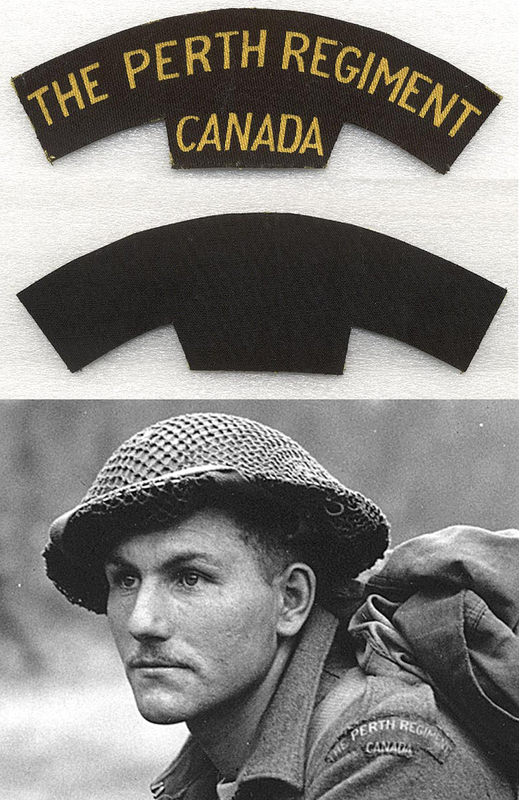 There are a couple of other variants of shoulder flashes that were introduced and worn by the unit before its return to Canada in Jan 1946. The title below tried to mimic the design of the printed canvas 2 coloured titles. It is Canadian made and would have only been worn after the cessation of hostilities when the unit was stationed in Sneek Holland. The final wartime title is one that was not worn by the 1st battalion during the war. 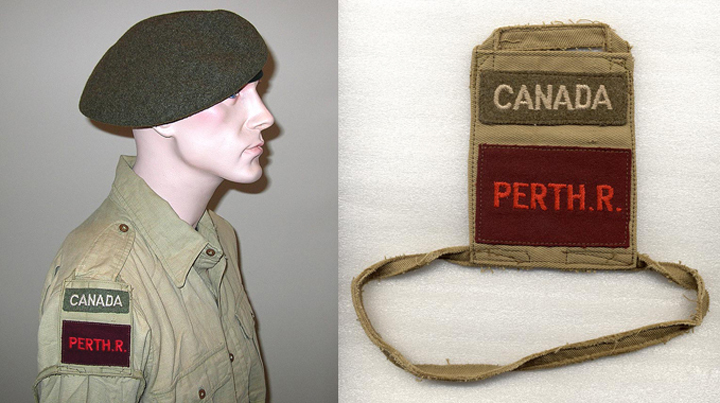 It is Canadian made and may have been worn by the reserve battalion in Stratford. Examples of this title are always found in mint condition. They appear to have some stitch marks on the back suggesting that they were being sewn onto a uniform. The stitch marks are incomplete with every example having the same marks. In addition to the standard insignia worn by the regiment during the war, there are a number of additional pieces of insignia that were worn by members of the unit. While the regiment was in Italy, it was part of the famous British 8th Army. This was something many of the men identified with. Being a member of this formation was something to be proud of. Some started to wear the 8th Army crusader patch on their left epaulette. While not something seen on a uniform while the unit was in theatre in NW Europe, it could be found on men convalescing in London. It was done against regulations. As Perth veteran Stan Scislowki recalls it was only when some &%$#@ provost came by that he was forced to take it down. 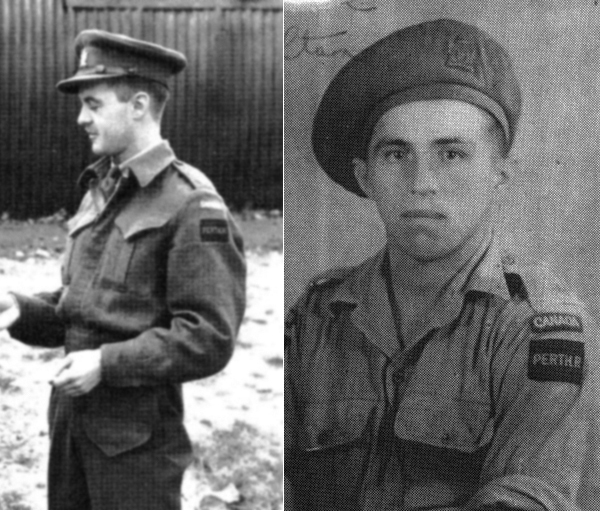 Personnel attached to other formations continued to wear their unit shoulder flashes, but wore the patch of the formation they were with instead of the maroon rectangle of the 5th Armoured Division. The end of the war in Europe allowed Canada to turn its focus on the Pacific War. Members who volunteered to join the Canadian Army Pacific Force (CAPF) wore a 6 colour octagon patch sewn onto their existing formation patch. The six coloured patch (each colour represented one of the divisions plus black for the armoured brigades) was worn with black and red at the top of the patch. 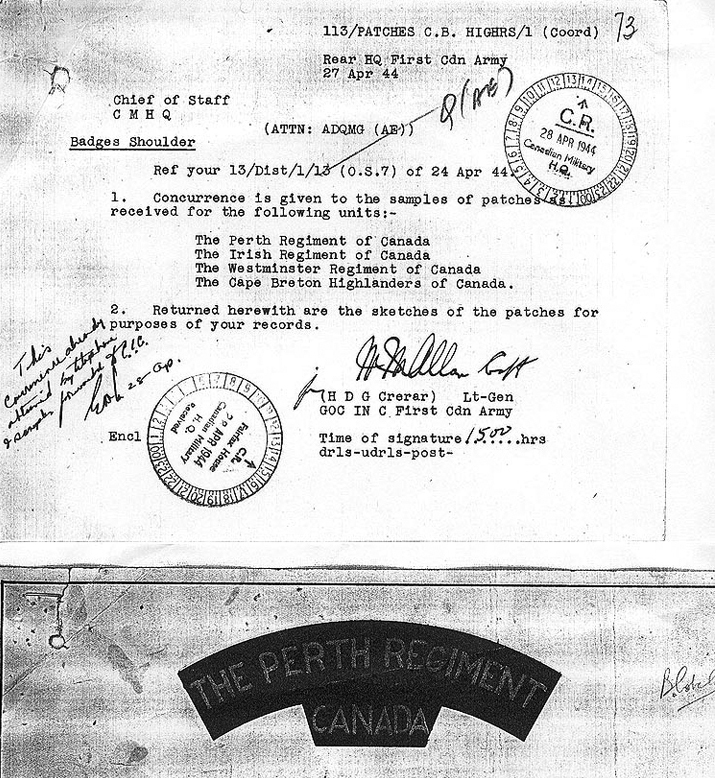 The Perth Regiment did not have a regimental button during the war. The book “Buttons of the Canadian Militia” by Eric Smylie incorrectly attributes a black rifle regiment button to the regiment for the period 1920-1952. 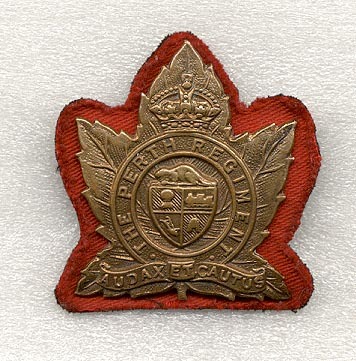 Unlike many militia and regular force units that had regimental and corps buttons prior to the war, the Perth Regiment wore GS (general service) brass buttons on their service dress and great coats. On Oct 22nd 1943, a formal request was made to CMHQ for a regimental button. Enclosed was a proposed design for the button that would include the Perth county coat of arms. 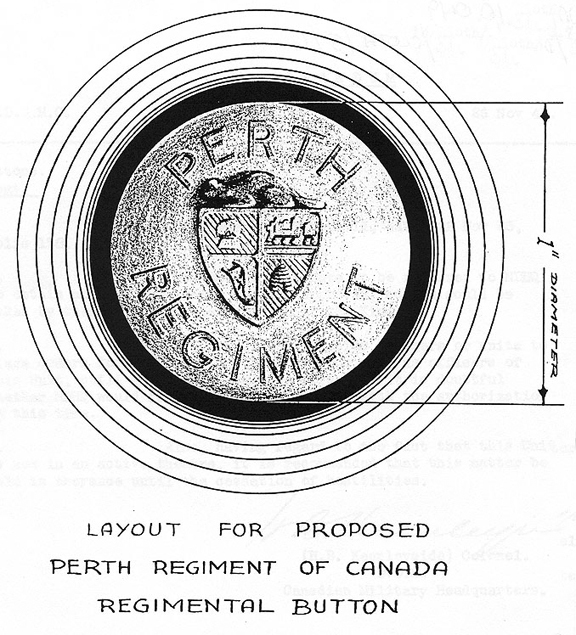 CMHQ referred to a Canadian Army Routine Order dated Oct 1942 that stated that regimental buttons would no longer be manufactured. The Perths were a year too late. The request was denied.